Reprint. This edition originally published: as Who's in charge. 2014. Never has politics been so important in the world and so much in the news as today. But how much of what goes on do we really understand? 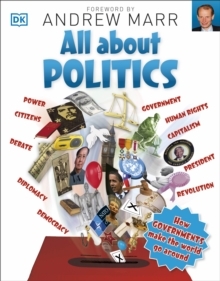 Written for children aged 9 and over, but a clear and interesting introduction for adults too, All About Politics is a straight-talking guide to how governments really work. All the political structures and ideas are covered, from ancient Greek philosophy to modern governments. With a low-down on all the key terms ending in "-ism", "-ocracy" and "-archy", you can discover the difference between democracy, monarchy and dictatorship - and also see which countries are governed by which system. Find out the pros and cons of communism and capitalism, what it means to be "right" or "left", and what happens behind the scenes in parliament. See how laws are made and explore the role of diplomacy. Plus you can trace a timeline of the history of leadership and discover how different systems and beliefs have developed. Importantly, there are sections about how you can get involved, covering local politics, voting, debating, and human rights. With a foreword by leading political journalist Andrew Marr, All About Politics covers all the big ideas and powerful people in politics, enabling everyone to join the debate and get their voice heard.